Many foods that we associate with Mediterranean cuisine today such as eggplant, tomatoes and lemon did not exist in Ancient Rome. The Romans always watered down their wine and only the people from the northern provinces drank beer. Many cheeses like cheddar, Cantal or Gouda trace their origins to Roman cheeses. This ancient Roman cuisine book is divided into two parts. The first part covers the history and evolution of ancient Roman cuisine, the eating habits of Romans, where Romans cooked and how they preserved their foods at a time when fridges did not exist. We learn that rich Romans ate reclined in couches while ordinary Romans ate standing up or sitting around a table and that Roman cuisine during the Kingdom was rather simple, a typical dish being pulmentum a porridge made of emmer, salt and olive oil. Roman cuisine became more diverse and sophisticated during the Republic and Empire. 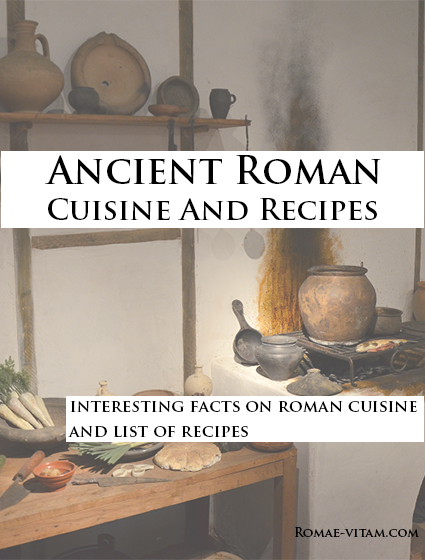 The second part of the ancient Roman cuisine book contains a list of easy-to-make Roman recipes with easily available ingredients at your local supermarket. You will learn to make your own bread the ancient Roman way, a delicious cheese spread called moretum or posca the drink of the army and of the plebeians. The list of recipes includes recipes for salads, meat and fish dishes, and desserts such as the aliter dulcia. You can download this book instantly by clicking on the Paypal "BUY NOW" button (secure payment via credit card or Paypal). This book is in pdf format and its cost is just $9.99. Thank you for purchasing our ancient Roman cuisine book and we hope that you enjoy it!